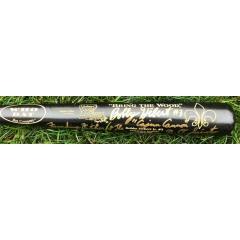 Here is a very limited Bobby Hebert Multi-Inscribed Who Dat Bat. Hebert has personally signed this bat and added four personal inscriptions to it. The bat engraved with the Saint's logo as well as a list of Hebert's career accomplishments. Hebert's signature and inscriptions come fully authenticated by JSA. Due to the limited availability of this item we must charge your credit card for the full amount of your purchase upon receiving your order. This will ensure we reserve this item for you. We will confirm your order by email.